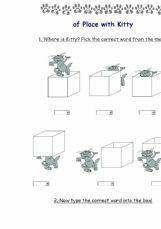 Practice some basic prepositions of place with dancing Kitty! Choose the correct word from a menu or type it in a text box. 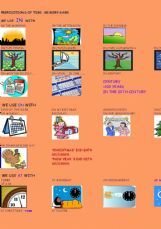 Useful online activities to revise prepositions and there is/ there are forms. 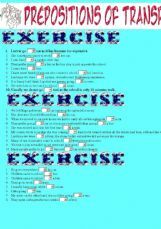 There are also listening exercises to improve listening skill. This is an OE to practise prepositions. 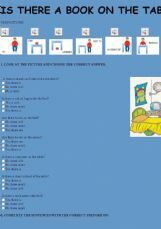 It contains several tasks with multiple choice and fill-in, accompanied with simple pictures to help the students. 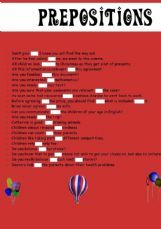 I hope it�s of use to you! Simple but fun and colourful exercises for beginners. 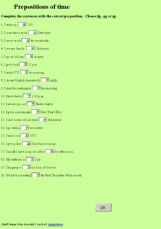 This is an exercise to test your students� ability to choose the correct preposition. 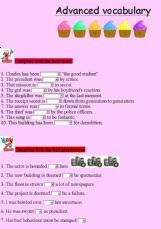 Prepositions exercises. Just for kids remember the prepositions of place.